Photos by Darryl Webb GCU News Bureau More than 5,000 underprivileged children received clothing and school supplies this week at Back to School Clothing Drive’s 21st annual summer distribution event in GCU Arena. Arizona Gov. Doug Ducey and Phoenix Mayor Greg Stanton were among 3,000 volunteers who helped students select items that were just right. The 21st annual Back to School Clothing Drive will wrap up Thursday at GCU as more than 5,000 underprivileged Valley elementary school students received free clothes and school supplies through the nonprofits massive volunteer operation. Arizona Gov. Doug Ducey joined the event this morning, helping kids to pick out some fresh threads that suit them for the upcoming school year. 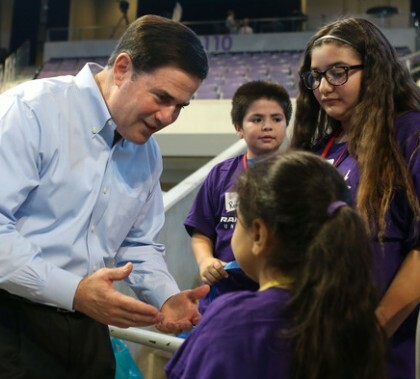 GCU Today has more about the governor’s visit and the event’s impact on helping children see what higher education looks like. This week’s Antelope Intros feature one new employee who takes flexibility to places that bend the mind (and a few other body parts) and another who pushes himself to the limits with his passion for running. Much of the furniture is in place and all four residence halls in The Grove, the new hub for freshmen on the northwest side of Grand Canyon University’s campus, are on track to be open for the start of the school year. But you don’t have to walk far to see all the other projects that have been completed or are in motion. Grand Canyon University Arena will be buzzing with more than 5,000 Valley children on campus July 13-16 for the 21st annual Back to School Clothing Drive. The event pairs underprivileged K-6 students with volunteers who help them pick out new, donated clothes and school supplies for the fall. If you haven’t seen it yet, imagine the Arena converted into a giant store for kids that otherwise might not have access to new shirts, shoes, backpacks and other essentials for the new school year. 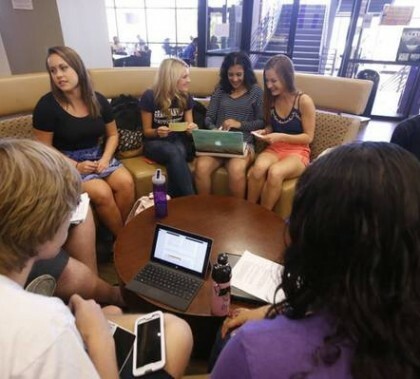 Like nearly everything on campus, Grand Canyon University’s Honors College is growing fast. The college, which changed from the Honors Institute to Honors College in June, will have a total enrollment of more than 700 students this fall, 11 times its size at inception three years ago, including 467 incoming freshmen with an average GPA of 4.16. Also new this year, Camelback Hall will be the first dedicated housing for Honors students on campus. 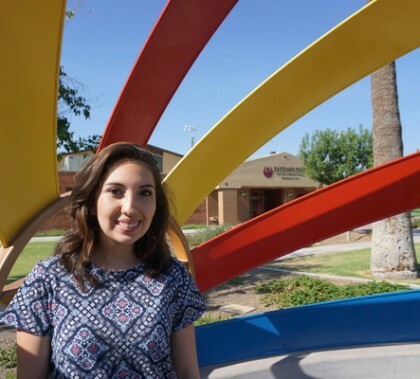 The rapid growth has brought added benefits to students and increased GCU’s status as a quality academic institution. Dr. Charles Cooke, who passed away last month at age 89, was a fixture at GCU for 35 years. His son and longtime friend shared their memories of a man who went out of his way for people every chance he got. Dozens of Grand Canyon University employees, primarily from the Military Division, engaged veterans at the Arizona State Veterans Home in games, a drum circle and military hymns, and also prayed alongside them as part of a regularly scheduled church service, during today’s annual Salute Our Troops event. GCU Today has a slideshow from the visit.